The Daily Signal is reporting today that Judge Scott Coogle, a United States District Judge of the United States District Court for the Northern District of Alabama, has ruled that the Alabama voter ID law is constitutional. In 2011, the Alabama Legislature passed a photo ID requirement for both in-person and absentee voting. The law was enacted in an effort to strengthen voter confidence and to reduce the potential for voter fraud in the state. The Alabama law accepts seven different types of ID, including an Alabama driver/non-driver’s license, a photo ID card issued by any state or the federal government, a U.S. passport, a student or employee ID, a military ID card, or a tribal ID card. Voters can obtain a voter ID card from the state for free—something that as of fall of 2017, only 33 voters in the entire state had requested. And voters who need a birth or marriage certificate to get an ID can get those for free, too. In addition, even if voters show up at a voting booth without an ID, they can still vote if two election officials at the polling place positively identify them. Those voting absentee are required to include a photocopy of their photo ID (in a separate envelope) when they mail in their ballot. Individuals without an ID can vote by provisional ballot, and that ballot will be counted if they show the local county registrar an ID by the Friday after the election. Unfortunately we live in a world where showing a photo ID has become a fact of life. When I go to the doctor’s office, I have to show a photo ID. If I board an airplane, I have to show a photo ID (and soon, as license requirements change in some states, a passport will be necessary). Anyone can easily get a photo ID, and states with photo ID requirements to vote will provide them to people at no cost. This is a common sense ruling. Hopefully it will stand and set an example for the rest of the states. Last minute smear campaigns work. That is unfortunate. There was never any proof of the allegations against Judge Moore; and in fact, some of the allegations have already been proven false. Where does this man go to get his reputation back? It is really sad to me that the establishment Republicans, who were so glad to see this man defeated, never once questioned the validity of the charges or fought back. Roy Moore was a threat to the establishment. He has made it very clear by his past actions that he believes in the Constitution. He would not have been easy for the establishment to control. Write-ins could have decided the race. Again, I think the victory of Doug Jones is a sad thing–no allegations were ever proven, and no charges were less than twenty-five years old. In claiming moral superiority, the establishment Republicans indirectly supported the election of someone who supports killing babies, does not support traditional marriage, and supports ObamaCare. I also believe the establishment Republicans did not want someone elected who would support the policies of President Trump–if the Trump economy continues to grow at its present rate, President Trump will be a successful President–the Washington establishment’s worst nightmare. They should be ashamed–not of Roy Moore–but of themselves. Does This Man Actually Want To Win The Election? Doug Jones is running for Senate in Alabama against Roy Moore. The Washington establishment (both Republican and Democratic) has tried very hard to get Roy Moore out of the race. Some of the charges against Judge Moore have already been shown to be false, so I am not sure what the voters in Alabama believe or how they will vote. I still think we may see Roy Moore win this election. He (Doug Jones) believes that every right enumerated in the Bill of Rights is limited, and the Second Amendment is no exception. He stressed that he loves to hunt but still believes in “smart” gun laws. This is a perfect illustration of the reason why Judge Moore should be elected. The statement that every right enumerated in the Bill of Rights is limited is false. The Bill of Rights was added to the U.S. Constitution in order to ensure the rights of the citizens–not to limit them. Also, the Second Amendment clearly states that the right to keep and bear arms shall not be infringed. What does Doug Jones think that means? We don’t need more limits on gun ownership. We need the government to enforce the current laws. The problem with the recent shooting in Texas was that the Air Force had not fulfilled its duty to report a crime to the people providing information on background checks. It should also be noted that the shooting in Texas was stopped by a legal gun owner. Any attempt to limit the ownership of firearms in America will be followed by a crime spree by those who have been able to obtain firearms illegally. An armed citizenry can protect itself from dishonorable people; an unarmed citizenry cannot. The Gateway Pundit has run a number of stories about the accuser of Judge Moore. Two of them deal with her past history of bringing charges and her work on behalf of Democratic candidates (here and here). The Republicans have a choice–they can support Judge Moore until something recent and believable is charged or they can use these charges as an excuse to remove a candidate whose primary opponent they funded. If they choose the latter, the base will totally desert them. The actions of the Senate in this matter will determine the future (or end) of the Republican party. If all the Democrats have to do is invent a thirty-year-old charge to cause a candidate to lose the support of the Republican Party, the Republican Party isn’t worth much. There is really one political party in Washington, D.C. It is made up of establishment politicians of both parties. They are an elite group that tends to make a lot of noise when an outsider invades their group. This group wants any outsider to fail, regardless of what that failure would mean to the country. The name of the game is protecting their elite circle and its power. Donald Trump has really messed up that circle and revealed for what it is. That is why ObamaCare is still with us, the wall has not been built, and tax reform is questionable at best. That is also why the media made such a big deal of a Democrat winning a gubernatorial race in a state that previously had a Democratic governor. The latest attempt at keeping an outsider out of Washington is the current salacious attack on Roy Moore, currently running for the U. S. Senate in Alabama. Suddenly candididate Moore is charged with having inappropriate relationships with underage girls thirty plus years ago. Think Clarence Thomas and Herman Cain–somehow the charges were not pursued after they made the confirmation of Judge Thomas very difficult and after Herman Cain withdrew from the presidential race. Judge Moore has been a judge since he was appointed in 1992. In 1992, Etowah County Circuit Judge Julius Swann died in office. Republican Governor H. Guy Hunt was charged with making a temporary appointment until the next election. Moore’s name was floated by some of his associates, and a background check was initiated with several state and county agencies, including the Etowah County district attorney’s office. Moore’s former political opponent Jimmy Hedgspeth, who still helmed the D.A.’s office, recommended Moore despite personal reservations, and Moore was installed in the position he had failed to win in 1982. “The impossible had happened!” Moore wrote afterward. “God had given me something that I had not been able to obtain through my own efforts.” Judge Moore ran as a Republican in the 1994 Etowah County election and was elected to the circuit judge seat (6 year term) with 62% of the vote. He was the first county-wide Republican to win since the Reconstruction. That was 25 years ago. If the charges were true, they would have been much more current then. Why were the charges not brought out then? Judge Moore is 70 years old. Even if the charges were true, there have been no other similar charges in the past 25 years. Why? The nomination of Jeff Sessions as Attorney General is a serious threat to the status quo, so the status quo is doing everything it can to block his confirmation. For the political left, that means playing the race card, and they have promptly done that. The Washington Examiner posted an article today about Jeff Sessions prior history as a U.S. Attorney in Alabama. The one thing the political establishment in Washington does not want is an Attorney General who actually enforces the law. Gateway Pundit posted an article yesterday about the 65th anniversary of the march in Selma, Alabama. On this day in 1965, state police under the command of the Democrat Governor, George Wallace, attacked African-Americans who were demonstrating for voting rights in Selma, Alabama. The rampaging Democrats used billy clubs and tear gas and dogs in their “Bloody Sunday” assault. A Republican-appointed federal judge, Frank Johnson, soon ruled in favor of the demonstrators, enabling them to complete their march two weeks later. A civil rights leader refused to march across the historic bridge in Selma during the 50th anniversary celebration Saturday because former President George W. Bush was also marching. Diane Nash, described as a lieutenant to Martin Luther King Jr., said she did not wish to march across the bridge in Alabama because she said Bush represented violence — something she claimed was at odds with the Selma legacy. History has been rewritten to erase the role the political parties played in the civil rights movement–the Southern Democrats opposed civil rights laws and the northern Republicans supported them. It is a shame Ms. Nash decided not to march instead of taking a stand for unity. Breitbart.com posted an article today about President Obama’s remarks about the “Bloody Sunday” civil rights march in Selma, Alabama, fifty years ago. Obama, who has enacted two executive amnesty programs for illegal immigrants since 2012, said that deporting DREAMers “is not true to the spirit” of the civil rights movement. I don’t even know where to begin. I have sympathy for the people who were brought here as children and had no voice in the matter. However, I also have sympathy for those people waiting in line and paying the fees involved to come to America legally. We don’t have to deport these children. However, if they have broken laws or committed crimes (that includes identity theft and social security fraud), they need to be sent back with their families to whatever country they are from. There is an attitude that comes from breaking the law that is not needed in America. Many of these grown-up children have families in other countries that their parents routinely send money to. If laws have been broken, these grown-up children and their families need to be sent back to their relatives. If they have kept out of trouble, they need to be put on a path to citizenship–but not given instant citizenship. They need work permits, but do not need to be eligible for welfare benefits. Meanwhile, the civil rights movement has no relationship to illegal aliens. The civil rights movement was a group of American citizens standing up for their rights. Illegal aliens are here illegally. They have already broken the law. We need to remember that. But that has not stopped amnesty advocates like Rep. Luis Gutierrez (D-IL), who has said that the amnesty movement is “our Selma,” from trying to link the amnesty movement to the black civil rights movement. Amnesty advocates will reportedly flock to Selma this weekend to try to push the false narrative that amnesty for illegal immigrants is akin to the black civil rights movement. 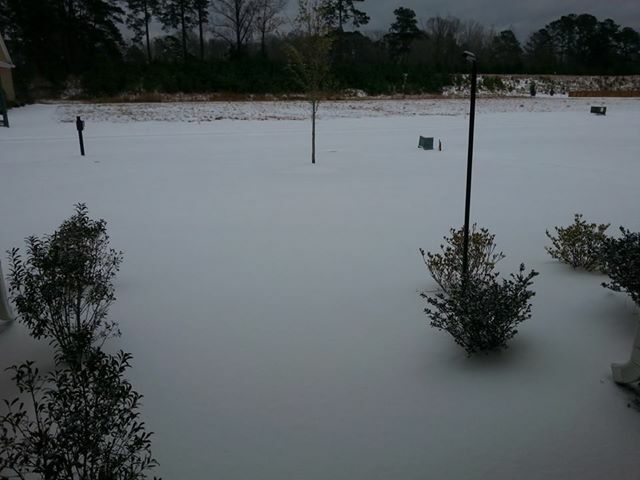 The Associated Press posted a story about the cold weather and snow that has hit the southeastern part of America. This is a picture of our neighborhood in eastern North Carolina. The weather is unusual and has temporarily crippled the local area. Overnight, the South saw fatal crashes and hundreds of fender-benders. Jackknifed 18-wheelers littered Interstate 65 in central Alabama. Ice shut down bridges on Florida’s panhandle and the Lake Pontchartrain Causeway, one of the world’s longest spans, in Louisiana. Some commuters pleaded for help via cellphones while still holed up in their cars, while others trudged miles home, abandoning their vehicles outright. No one knew exactly how many people were stranded, but some employers such as Blue Cross Blue Shield in Alabama had hundreds of people sleeping in offices overnight. Workers watched movies on their laptops, and office cafeterias gave away food. The good news is that it will be above freezing in most places tomorrow and in the upper 50’s and lower 60’s by Saturday. Regular readers of this blog are familiar with Agenda 21. I have written about it a number of times (one example–rightwinggranny.com). Essentially, Agenda 21 is a UN-backed program to end private property rights in America. Agenda 21 has not been ratified by the U.S. Senate, but it may not have to be if in a second Obama term the Environmental Protection Agency pursues it by stealth, as it has other environmental agendas that make war on the free enterprise system and rights we hold dear. One of those is property rights. “Land … cannot be treated as an ordinary asset, controlled by individuals and subject to the pressures and inefficiencies of the market,” Agenda 21 says. We live in a representative republic that theoretically honors states’ rights. It is encouraging to know that one state recognizes the potential problems that could be caused if the federal government continues to usurp those rights. Hopefully other states will follow the example of Alabama.